The best way to get a high-quality power tool is to go with the well-established brands that have proved their reliability and trustworthiness. Dewalt is definitely one of those brands, and they have more than enough of choice to offer to their clients. The DWM120k model is a perfect solution for both professionals and enthusiasts who are looking for a good machine that doesn’t cost a fortune. Many people make a common mistake of getting the first thing they find visually appealing which later proves to be a huge mistake. There is much more to it than just design, aesthetics, and compactness. If you’re interested in getting a better insight into the capabilities of this particular unit, stick around and read our review. It should help you to comprehend the pros and cons of this unit and eventually make a valid decision on whether or not you’re willing to invest in this power tool. If you’re familiar with this industry, then you probably heard about Dewalt before. They are a well-established company with a long history of great products behind them. This particular one isn’t any different. The 10-amp motor is capable of cutting through a vast variety of materials without too many issues. In fact, it can cope with metal, plastic, wood, and etcetera. The best thing about this model is its overall usefulness. It’s not fundamentally different from most of the other ones that are available on the market, but small things that are integrated into the unit itself make it one of the desirable ones at the moment. When it comes to the design, it’s as good as it can get. The high-quality materials used in the production of this unit guarantee sturdiness and reliability while the ergonomic components ensure fatigueless operation. Even though most of these units seem like they don’t require too much effort, you can rest assured that the prolonged use does cause some issues in the long run. However, thanks to the innovative ergonomic design, the DWM120k drives fatigue levels to a bare minimum. The casing is protected by a couple of rubber shrouds. Surprisingly, that’s about it when it comes to external protection of this unit. It does raise some questions among the users, especially the ones that utilize this machine on a daily basis, but it proved to be quite sturdy and resistant to external influences. In simpler terms, even though it seems pretty basic, there is more than enough protection included in this model. This model is ideal both for devoted professionals and occasional users thanks to the variable speed system. In other words, by being able to adjust and fine-tune the speed of the blade, you can coordinate which materials to cut. It’s a significant advantage over the 1-speed motors because it adds a healthy amount of versatility. Also, thanks to the sturdy design, the DWM120k can be used in any environment without any issues whatsoever. 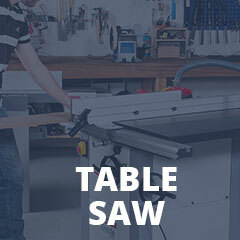 On top of that, one can mount it on a worktable and use it as a portable vertical bandsaw. There aren’t many additional features that could make a significant difference. The LED light is a neat addition, but it’s far from a crucial one. However, it does come in handy, especially if you’re frequently working in a dark environment. There are plenty of things we liked about this particular model. In fact, it’s one of our top-recommended ones for indecisive people. If you aren’t sure about the quality and reliability of some other models, this one is always a safe bet. The most notable advantage over many other similar models is the fact that it doesn’t require any significant adjustments and fine-tuning out of the box. On top of that, thanks to the simplistic design it’s one of the easiest to get the hang of. All you have to do is read the user manual and follow the instructions. If you already have experience with these tools, reading the manual might seem redundant, but it’s always a good idea regardless of your expertize. The “k” in the name stands for the included hard case. However, many people complained about not receiving the case with the model. On top of that, Dewalt’s customer support department is notorious for not responding promptly. They do eventually try to solve the issues you have, but it might take a while. It can be a real problem if your warranty is about to expire and the unit suddenly breaks. However, these are all rare cases and shouldn’t be taken for granted, but should still be pointed out so that you know what to expect if it ever happens to you. This brand has a dedicated user base that consists of thousands of people. Naturally, the opinions are quite diverse and they usually depend on a few factors that are not under Dewalt’s control. The general impression is good and most users love their DWM120k. On the other hand, there are plenty of people that have something against either its design or performance. As far as we are concerned, it’s a worthy investment if you’re willing to use its full potential instead of using it for occasional projects. It’s quite hard to make the right choice with these machines. In fact, most people will tell you that there is no “right” choice, but instead, it all comes down to your personal expectations and requirements. If you think that this model does fulfill most of your expectations, there is no reason not to get into more details. As we already said, it can be a worthy investment if you have a large enough budget. Speaking of budget, this particular model does have a hefty price, but it’s worth every penny thanks to the high-quality components inside.